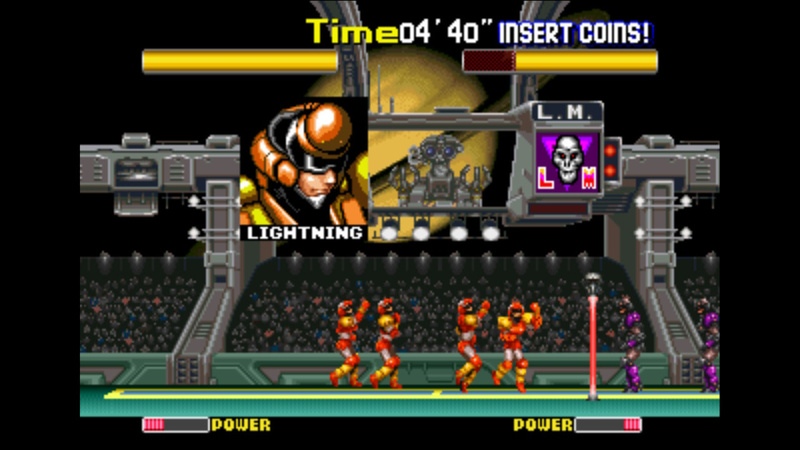 In among the Neo Geo library of games there are a number of titles (some already on Switch) that take a sport and rework it into a simple, quick-to-play arcade experience. The latest arrival on the eShop is Video System’s Power Spikes II, a volleyball game that gives you a choice of eight four-person teams and then has you compete against five others; beat them all to become champion. 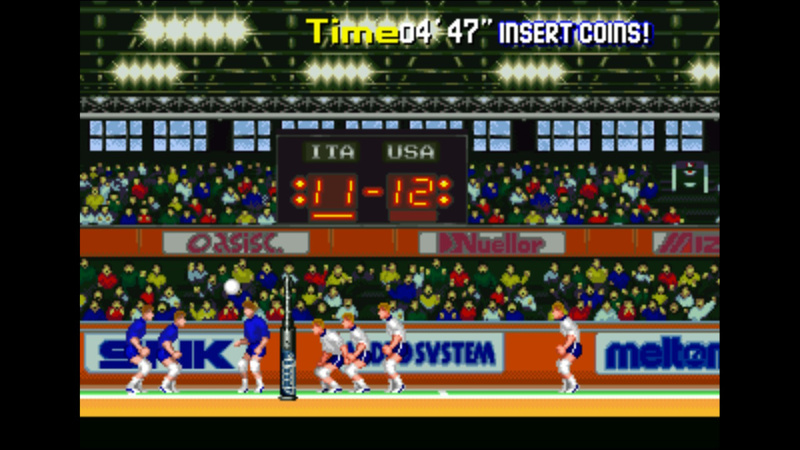 The first (non-Neo Geo) game provided a straightforward regular volleyball experience and while that is still available here, the first mode on the selection screen after inserting your credits is 'Hyper League': a futuristic version of the sport. To try and avoid drawn out play, each match skips ahead to the final set which you must win to proceed. 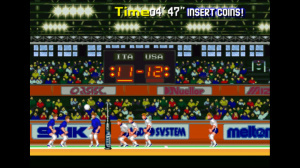 As with regular volleyball, the aim is to knock the ball over the net to land in the opposition’s side of the court. Doing so will not reward you with a point, but rather deduct a portion of the opposition’s health bar; drain it completely to win. There are a few types of serve and different moments when you can spike the ball as well as some special moves to try and catch out the other team. This may sound like it offers the potential for fun, frantic gameplay, but it’s a quite simplified take on the sport. 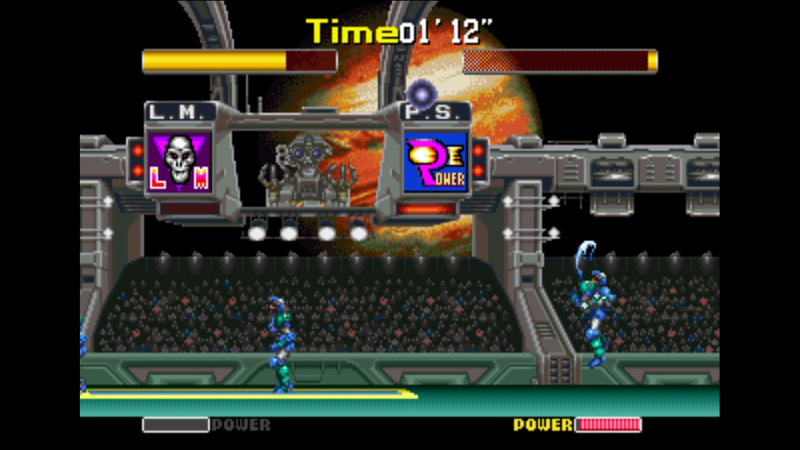 Your team cannot move freely about the court as the action is viewed side on with small sprites. Animations for moves and dives are quite well done, but some walks and runs are a bit basic. The game is not bad looking for the time, but is a lot simpler than most other titles on the hardware. Characters lack features, but more detail is shown in boxouts with pictures of celebrations or of officiating Aero Fighters' Johnny 5 lookalike, Tee-Bee. When defending you can press the multi-purpose action button to make the front three players jump up to try and block shots, while a receiver sits further back and can be moved forwards or backwards to try and intercept any serves or spikes that have got past. Manage that and it’s your turn to attack, the ball knocked between your players, before giving you a chance to spike it past the opposition. There's some freedom on when to hit the ball (as long as you do it before it hits the floor), but the quickest shots are performed should you time your button press just as the ball turns pink. Despite the simplicity of the controls, winning can initially be tricky as you try to move into position to get the ball. An arrow will show where the ball will land and depending on where you are positioned this can require sudden reaction to get to the required spot. It’s a good idea to note your positioning in relation to where the shot came from as after a few games the arrow disappears, so you’ll need to be able to judge for yourself. What can make this tricky is the way the camera moves to focus on where the ball is, meaning sometimes your character is off-screen. This creates situations where you need to remember where your player was, note where the CPU shot is likely to come from and then try and work out how much to move your unseen player, who hopefully is where you think they are. Should you manage to align the receiver with the incoming spike or serve, you can of course prepare for your own offence, but misjudge it slightly and the ball will bounce up behind you. Though this preferable to completely missing it, getting the ball out of your half in these situations requires some work. After running to stop it hitting the ground, you get given control of someone else to come back and assist (helpfully indicated by the way their sprite flashes). Get used to the basics and you may want to start experimenting with special serves and spikes. Using a second button, you also need to input a command when prompted to perform your required move. Though not particularly complicated (and giving you plenty of time to enter the commands) it's a bit fiddly compared to the straightforward play elsewhere in the game. Inputs vary team to team, so you’ll need to bring up the electronic manual to see your options. These moves can send the ball in at awkward angles and while not necessarily harder to stop, the added visual flair of flames and rippling electricity can be a distraction. In some cases hitting a player with the ball will momentarily knock them down, leading to a scramble to get into position the next time the ball comes over the net. The game gets easier once you’ve got the hang of it so you won't be missing as many balls, but with the opposition getting more competent as the game progresses, matches can be quite uneventful as the ball is simply knocked back and forth. 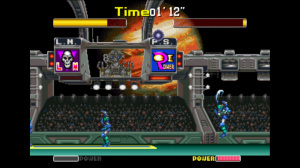 The five minute time limit may initially go unnoticed, but later games go the distance with the winner being decided on their amount of health bar (serving team wins should this be equal). For a more traditional form of volleyball, World League can be selected (either male or female teams) that also gives you a series of matches to complete in, again in the final set. 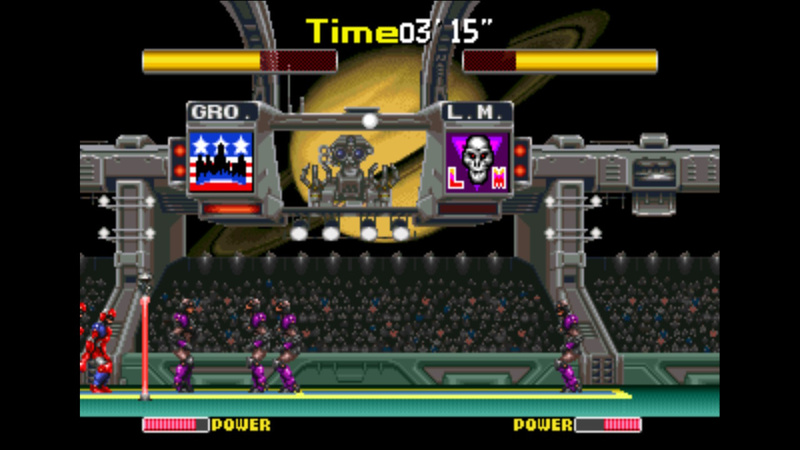 Replacing the planet-in-space backdrops with a crowd and featuring a human referee, it plays largely the same as the Hyper League but without the power moves. Another difference is that this time you are playing for points. Beginning your first match a single point ahead, by the final you have a three point deficit which adds to the challenge as you go trying to catch up. Manage it and it can actually be more entertaining than the Hyper League, but it can also frustrate when you are struggling to score. All three modes can be played in competitive two-player should you wish and in the case of the World Leagues the opening score is the same to prevent anyone starting with an advantage. 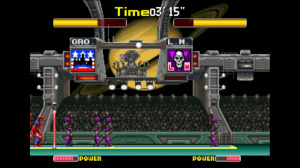 The options menu includes the usual ability to adjust CPU difficulty and the time limit can be changed to as low as 30 seconds and to as high as almost 30 minutes – although even with long bouts of no scoring it’d be difficult to get a match to last that long. 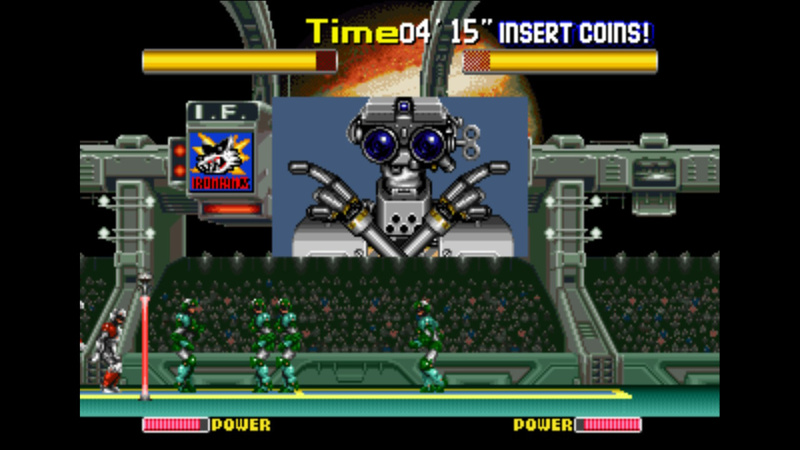 As with all ACA Neo Geo releases there’s the five-minute Caravan mode in which you try to score as many points as possible within the time limit and the Hi Score mode in which you aim to clear the game on a single credit. As always these (and the arcade mode) have an online leaderboard for you to try and move up as you compare you skills to players from around the globe. 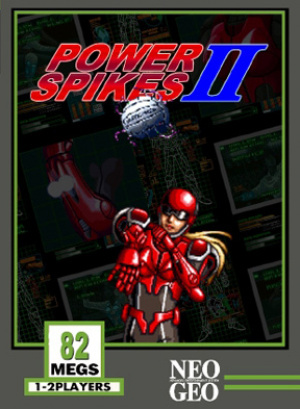 Once you've got the hang of things Power Spikes II is a simple volleyball game that can provide some entertainment. There's a range of serve options, power shots and frantic moments where you hope to get to the ball in time, but the simplified nature leads to little variety even with the various shot types. There are times you can score quickly (maybe even from a serve) and there is a rush of excitement when you do so, but there is also a lot of time spent knocking the ball back-and-forth, simply tapping left or right to get into position to make sure the process can continue. Ultimately Power Spikes II is a little too simple to offer long term appeal. Yeah, i figured as much. I’ve honestly skipped most of the sports gsmes in the aca neogeo line up. Mostly in fear, not knowing if its a good game. (Except for Neo Turf Masters. That game is godlike!) Can people who know about them more than me reccomend me some??? @MotionMan Street Hoop is a pretty rad basketball game. And Super Sidekicks is a fun soccer game. @SuperWeird Thanks!!! I’ll pick them up soon and try them out!! Would pick them up this week but Strikers 1945-2 and Zero Gunner 2 are taking my top priority this week! TFW Nintendo Volleyball and Super Spikes V'Ball have more gameplay going on than an arcade volleyball game. Not every one of these is going to be a winner, folks. @MotionMan Street Hoop (a.k.a. Street Slam, Dunk Dream) and Super Sidekicks (one of them, I forgot which) are already available. @Faruko : This is Hyper VBall. And to me, this game is better than what the review exposes. Its flaws (the defending player being off screen, the skill required to deal with vertical saves, the defense at the net) make for a great challenge and a motivating learning curve. The special moves are too unpredictable, so it's safer to stick with the human teams. Then again this is an old fashioned game and might not appeal to everyone, but it's worth checking out. @MotionMan : Wait for Windjammers. 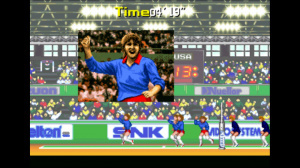 It was the best "sports" game on Neo Geo, by far. @BennyBlanco windjammers is amazing, one of the best games ever. It also has an active community of French players, not sure why it’s specific to the French, but there you go. Sports games have never been amazing on the ACA lineup but I will be getting this regardless, they are just fun little arcade titles to mess around with, and at $8 the price is right for something that I don't need to get a lot out of. What a waste of 82Megs. Would rather had seen Strikers 1945 Plus or Prehistoric Isle. @wasilewski It's probably because Neo Geo arcade cabinets were pretty popular in France back in the day, since they offered a much cheaper alternative to Jamma machines. @MotionMan when Baseball Stars 2 it’s the Switch I recommend that. Fun game there. @SuperWeird @masterLEON @BennyBlanco @shonenjump86 Thanks for all the awesome suggetions!!! Im going to get these ASAP!!! I enjoy playing Power Spikes II , i have the original MVS game since years and now i can play it on the move with my Switch. Still waiting for Trash Rally now. @OorWullie that is a cool bit of history. Hopefully there is a small chance of Dotemu releasing Windjammers on Switch. Meh, it is a pretty good game badly reviewed. A true classic.